India's Supreme Court has ruled that Bollywood actor Sanjay Dutt must return to prison for his connection with the 1993 Mumbai blasts. The actor has been on bail since 2007 when he appealed against his original sentence of six years. On Thursday, the Supreme Court reduced it to five years. Dutt was convicted in 2006 of buying weapons from bombers who attacked Mumbai. He spent 20 months in jail. The serial bombings killed 257 people and wounded 713 others. In 2006, a special anti-terror court had convicted 100 people for the blasts - 12 of the convicts were given death penalty and 20 others were given life sentence. On Thursday, the Supreme Court also upheld the death sentence of Yakub Memon, one of the main convicts, while death sentences of 10 others were commuted to life. Mohammed Iqbal, who was also given death sentence, died while in prison. 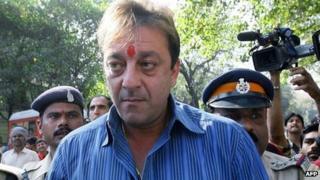 Dutt, one of Bollywood's most bankable stars, is hugely popular for his role of a loveable gangster in Munnabhai movies. He has also dabbled in politics. The judges have ordered the actor to surrender in four weeks. "He will have to serve another three-and-a-half year sentence. We had prepared him for the same," Reuters quoted Dutt's lawyer Satish Maneshinde as saying after the Supreme Court verdict. "We will wait for a copy of the judgement and then decide the further course of action," he said. "He is a strong man and will fight back." "Whatever is the judgement of the court I will respect it. I want all to pray for me. God is great," NDTV channel quoted the actor as saying after the court order. Dutt, the most high-profile among the convicts, was originally charged with five offences, including criminal conspiracy and possession of illegal weapons. The trial court had found him guilty of illegally possessing a rifle and a pistol but cleared him of conspiracy. The son of a Hindu father and Muslim mother, Dutt said the weapons were necessary in order to defend his family during the Hindu-Muslim rioting of 1993 which had followed the destruction by Hindu zealots of the Babri mosque in the northern town of Ayodhya. The Mumbai blasts were allegedly carried out by the city's Muslim-dominated underworld in retaliation for the riots, in which most of those killed were Muslims. The man who is believed to have masterminded the plot, underworld leader Dawood Ibrahim, has still not been caught. India says he and another key suspect, Tiger Memon, are hiding in Pakistan - a charge Pakistan denies.